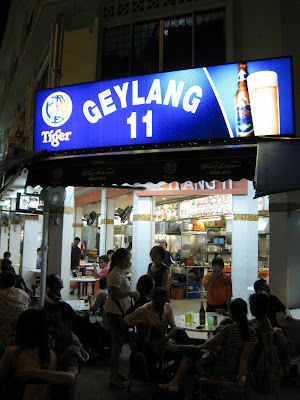 My first visit to Geylang was during a hot and sunny day, and I was not impressed by it. It changed during a recent night visit to the King. Few months back, when I talked to one my friend about my lack of entertainment in Geylang, he started laughing and told me that as a born and raised Singaporean he could share his keys to open some doors to the dark nights and bright lights of Geylang, but he recommended me to be careful and not feed the animals I might encounter during my night safari visit there. Taking food as an excuse for a nigh visit to Geylang, I accepted his dinner invitation, but requested for a nigh version that time. As soon as we arrived there I quickly realized that I had previously not only visited the wrong side of the place, but also at the wrong time. 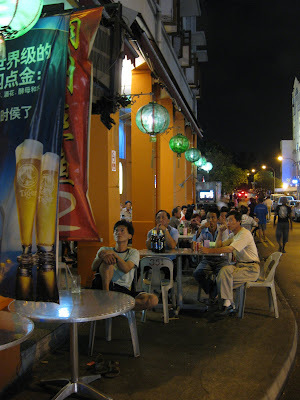 One side of Geylang is a large and quiet residential area, but on the other side you find hourly rented room and lively sidewalk talks, but it all happen at night, never during the day (because the is the time people from the profession sleep, stupid!). What struck me the most during this exploration of the local night fauna was that like in the Savanna, animals gather at night around refreshment and food point. An obvious observation when you think that if you let your instincts talking, you might as well let your stomach having a share of the fun as well. I noticed that a man on an empty stomach has always a too predominant conversation toward food and will not let his other animal aspirations resurface, so if you propose a large portfolio of services including paid visit to human counterpart coupled with details acquisition of dishes in the same place, don't expect nothing less than a profusion of food style and numerous cheap restaurants over the long run. 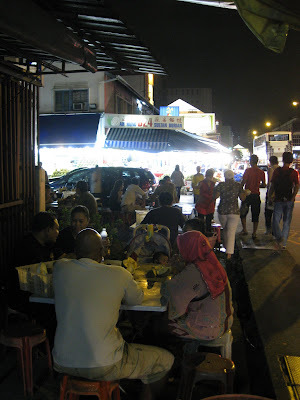 That's probably why Geylang has been rated as one of the most interesting food destination in Singapore, with its late restaurants and fresh seafood platters. Aside from the delicious food we had that night, I was really impressed by the number of people gathering around the durian stools. In almost no space at all, durian seller managed to propose a wide selection of fruits half on the sidewalk, half on the road. 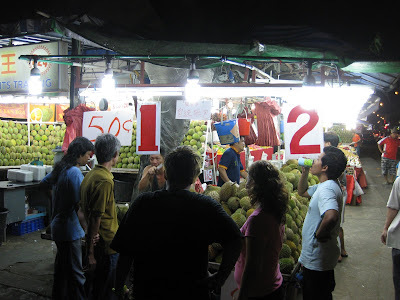 And like hundred craving butterflies crashing on a lantern, people were attracted by the durian seller bright lights and unequivocal fruit smell. Cars stopped, windows were rolled down and prices were asked in a matter of second, taking advantage of the traffic light. If the price was set right, the negotiation could begin. 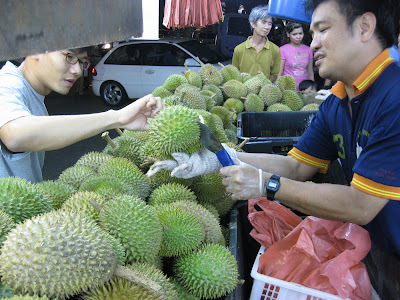 The durian man dressed with a glove in one hand a knife in the other, cut a small incision in this round and spiky object of trade. It has been said to me that experience aficionados could choose Durian by just smelling and looking at the inner color of the fruit. When you think that the fruit can grow up to 30 cm long and 15 cm in diameter, typically weighs one to three kilograms, and its shape ranges from oblong to round, the color of its husk green to brown, and its flesh pale-yellow to red, depending on the species, it's a long training to have. 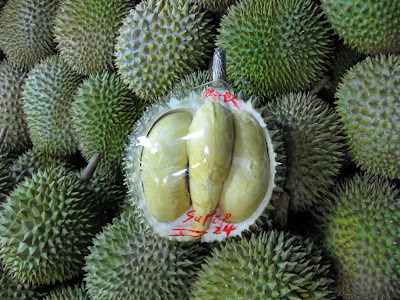 The Durian flesh emits a distinctive odor, strong and penetrating even when the shell is intact. I have not found any comparison so far in my catalogue of smell to describe it, but I can guaranty you that the smell evokes always a reaction from deep appreciation to intense disgust, never ignorance. The odor is so strong and persistent that the fruit is banished from hotels, taxi and any public transportation in Singapore. 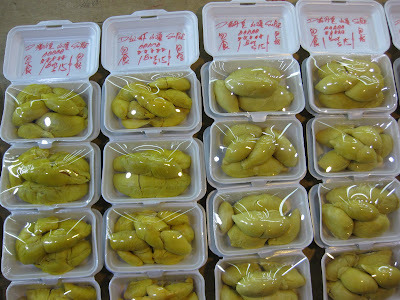 Board signs above the fruit usually indicate the quality and the origin of the delicacies dessert. Look for a D at least and a maybe a double digit number if you like strong taste and smell, although if you prefer exotic travel ask instead for a Mao Shan Wang (Cat Mountain King). I am not too sure who had decided to categorize the Durian family with such unappealing names but I will be alone to start a new trend and give them new fresh label. D24 was the reference by which bargainer were exposing themselves to stranger, and has been commonly recommended by endless taxi drivers in Singapore. 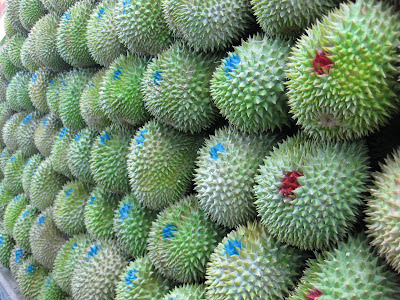 Don't be fooled by a fruit, Durian had become a reference in people's imagination with various quotes and proverbs in different languages across various South East Asian nations. It usually illustrates bad behaviors and strange habits that one can not let go off, but happy to entertain like a selfish pleasure. Over my stay in Singapore many times I heard strange stories about sleeping safely under a Durian tree, or one can die from eating Durian together with whiskey, or can cause heatiness and sore throat, or the only place to have a safe durian experience is at Mr Goh Kwee Leng place. 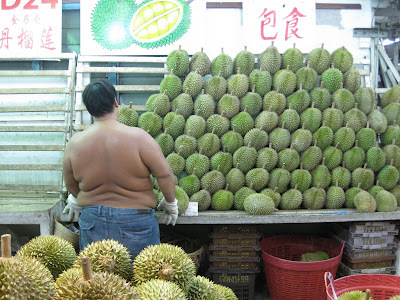 But as the famous proverb says that you should never trust a Durian Seller, I will not trust any Durian stories either, especially the one telling me that this is the best fruit on the planet. 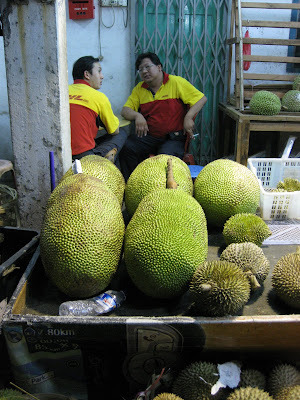 On my way back home that night, a question popped in my mind: if Durian is the "King of Fruit", who is the Queen of Geyland then?